Robert Crown Wilderness Area is comprised of 347 acres of protected and undeveloped land west of New Port Richey and the Gulf Harbors Sea Forest subdivision. 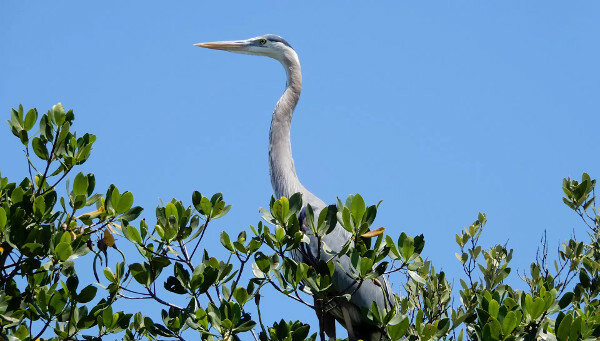 Owned and controlled by the Florida Department of Environmental Protection, the area - consisting mostly of wetlands - has historically had more bird species observed than any other site in Pasco County. Well over 200 species of common, rare, and endangered species have been reported. You will find no signs directing you to the Robert Crown Wilderness Area. It is an area only accessible by watercraft. Although there are some areas of high ground, they are not accessible and there are no hiing trails. This is an area of interest only to kayakers and fisherman. Bounded on the north by Green Key Road, on the south by the Flor-A-Mar canal, on the west by the Gulf of Mexico, and on the east by the Crown canal, it is an area almost entirely surrounded by water. At the north side of the area, there is a small preserve owned by Pasco County Environmental Lands known as the "Boy Scout Preserve". However there is no access available into the Robert Crown Wilderness Area from that site. Kayakers will find that the easiest way to access the Robert Crown Wilderness Area is along Green Key Road, where there are several possible launch points. Parking is permitted along Green Key Road. It would also be possible to launch from the nearby Robert K. Rees Memorial Park on Green Key. For those wanting to rent a kayak to explore the area, there is a kayak rental facility at the east end of the Flor-A-Mar canal, which is just off Highway 19 at Marine Parkway. Paddling along the creeks within Robert Crown Wilderness Area is a real treat. But you'll need at least two feet of tide because the waters are shallow in places. The north creek is narrow and windy ... and the south creek is wider, but has large limestone outcroppings to watch out for. The south creek, in particular, generally has clear water, and is particularly impressive at tide changes. In addition to lots of fish, look for blue crab, horseshoe crab, and rays - all of which are common in this area. Check the links below for a map of a 2.1 mile kayak trail that makes for a pleasant afternoon paddle.